Saint Pierre Locations offers vehicles that are accessible to people with reduced mobility. Since we are determined to make Martinique accessible to everyone, Saint Pierre Locations has a fleet of wheelchair-accessible vehicles. 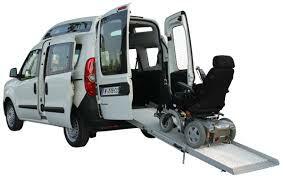 Each is equipped with an access ramp for seating passengers with manual or electric wheelchairs in the back. The vehicles are delivered with tie-down kits that have been installed by certified auto body mechanics, such as Parafarm, a French company with a branch in Saint Luce. Whether you need a vehicle to take children to school, transport people with reduced mobility or show tourists the sights, Saint Pierre Locations has the vehicle for you. Our vehicles allow you to overcome the most common challenges you’ll face when transporting people with reduced mobility around the island. Saint Pierre Locations makes Martinique accessible to all. 2 branch locations in Martinique: Four à Chaux in Lamentin and Quartier du Fort in Saint-Pierre.